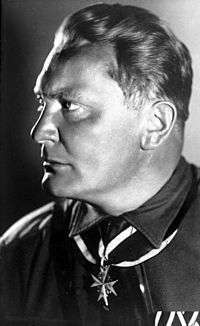 Carl Schmitt (11 July 1888–7 April 1985) was a jurist, philosopher, political theorist, and professor of law. Schmitt joined the Nazi Party on 1 May 1933. 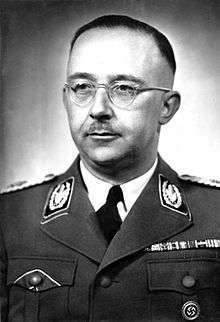 He presented his theories as an ideological foundation of the Nazi dictatorship, and a justification of the "Führer" state with regard to legal philosophy, in particular through the concept of auctoritas. Nevertheless, in December 1936, the SS publication Das schwarze Korps accused Schmitt of being an opportunist, a Hegelian state thinker and basically a Catholic, and called his anti-semitism a mere pretense, citing earlier statements in which he criticized the Nazis' racial theories. After this, Schmitt resigned from his position as "Reichsfachgruppenleiter" (Reich Professional Group Leader), although he retained his post as a professor in Berlin, and his post as "Preußischer Staatsrat". Although Schmitt continued to be investigated into 1937, further reprisals were stopped by Göring. In 1945, Schmitt was captured by the American forces and released in 1946. Schmitt refused every attempt at de-nazification, which effectively barred him from positions in academia. Henry Ford (July 30, 1863–April 7, 1947) American industrialist, the founder of the Ford Motor Company, and sponsor of the development of the assembly line technique of mass production. His book "The International Jew" was praised by Hitler for its antisemitic rhetoric. ↑ Richard J. Evans (2004). The Coming of the Third Reich. London: Penguin Books. pp. 178–179. ISBN 0-14-100975-6. This was intended to provide the Nazi Party with a major work of theory. The book had sold over a million copies by 1945 and some of its ideas were not without influence. ↑ "Dietrich Eckart". Jewish Virtual Library. Retrieved 2009-01-04. Later on, he developed an ideology of a 'genius higher human,' based on earlier writings by Lanz von Liebenfels; he saw himself in the tradition of Arthur Schopenhauer and Angelus Silesius, and also became fascinated by Mayan beliefs, but never had much sympathy for the scientific method. Eckart also loved and strongly identified with Henrik Ibsen's Peer Gynt. ↑ Jackson J. Spielvogel and David Redles (1986). "Hitler's Racial Ideology: Content and Occult Sources.". Simon Wiesenthal Center Annual. 3. Retrieved 2007-08-22. ↑ Essai sur l'inégalité des races humaines - A de Gobineau, H Juin - 1940 - uqac.ca. Archived October 30, 2005, at the Wayback Machine. ↑ Martin Luther (1543). On the Jews and their Lies. Our Lord also calls them a "brood of vipers"; furthermore in John 8 [:39,44] he states: "If you were Abraham's children ye would do what Abraham did.... You are of your father the devil. It was intolerable to them to hear that they were not Abraham's but the devil's children, nor can they bear to hear this today. ↑ The Roots of Evil. Cambridge University Press. 1992. ISBN 0-521-42214-0. Many Nazi beliefs and ideals seem to be highly similar to those expressed by Nietzsche. ↑ Journal of Church and State - JC Fout - Adolf Stoecker Antisemitism – 1975.